Attorney General Jeff Sessions at an event discussing immigration policies on Sept. 10. President Trump said on Tuesday that he's disappointed in the attorney general's job performance for a number of reasons, beyond his recusal from the Russia investigation. Attorney General Jeff Sessions' future was cast further into doubt on Wednesday after President Trump made clear how broad his displeasure is with the man he tapped to lead the Department of Justice. "I don't have an attorney general," Trump told Hill.TV in an interview on Tuesday. Trump's frustration with Sessions isn't only over his decision to recuse himself from the Russia investigation, Trump said, but over many other aspects of his performance. 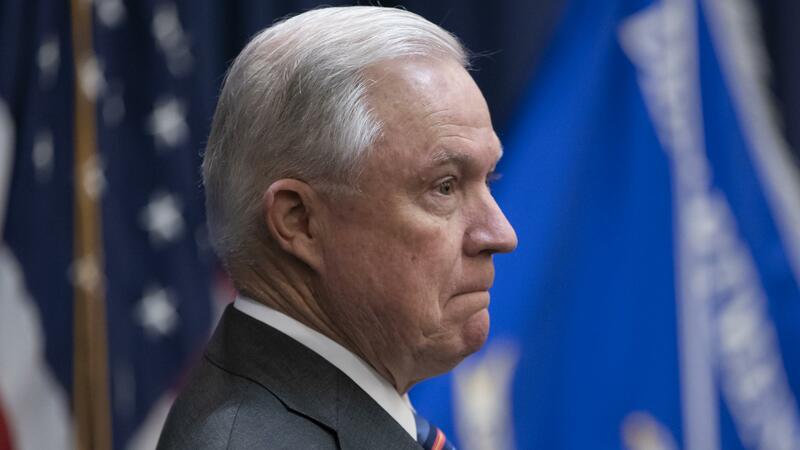 The attorney general has said he won't bow to political pressure and that he recused himself citing Department of Justice regulations that he says are pertinent because he was involved in the Trump campaign. The Justice Department declined to comment to NPR on Wednesday. Trump remains angry with Sessions about the Russia investigation, but the president made clear he is frustrated with much more than that. "I'm not happy at the border, I'm not happy with numerous things, not just this," he said. Trump suggested that his personal loyalty to Sessions clouded his judgment in choosing him as attorney general because he was the first senator to endorse Trump during the campaign. Senate Republicans have in the past warned Trump against firing Sessions, but that mood has shifted among some key White House allies on Capitol Hill. Sen. Chuck Grassley, R-Iowa, the chairman of the Senate Judiciary Committee that reviews attorney general nominations, had said last year there was "no way" to confirm someone new. But recently he told Bloomberg, "I do have time for hearings on nominees that the president might send up here that I didn't have last year." Trump suggested recently that he wouldn't fire Sessions before the November midterm elections. The president has long asserted that Sessions should have told him before being nominated that he would recuse himself from the Russia probe, which is consequently overseen by Deputy Attorney General Rod Rosenstein, a Republican whom Trump also nominated to his post. Rosenstein, in turn, appointed special counsel Robert Mueller to lead the investigation shortly after Trump fired FBI Director James Comey. That appointment and the larger investigation continue to anger Trump, which he called a "hoax" in the interview with Hill.TV. In the president's view, the story is about the need to root out "bias" and corruption within federal law enforcement. "I hope to be able put this up as one of my crowning achievements that I was able to ... expose something that is truly a cancer in our country," Trump said. Just last week, former Trump campaign chairman Paul Manafort became the latest associate of the president to plead guilty, though on charges unrelated to the campaign. A number of the president's other associates also have pleaded guilty to federal charges, including his longtime attorney Michael Cohen, deputy campaign chairman Rick Gates and former national security adviser Mike Flynn.